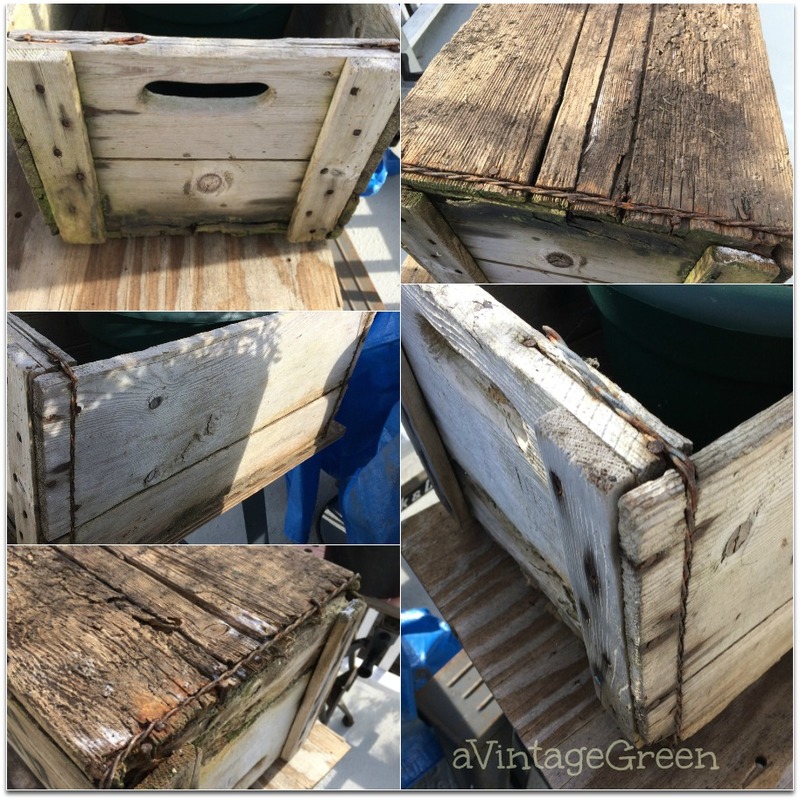 A really rotted and worn out bottom on a very weathered wooden crate was sitting at the curb, free. That was the beginning. You know a stencil or two will be involved. Peonies (my favourite flower) in the stenciled crate overlook the backyard at 8:30 pm. Early June is peony blooming time in my area and the perfume is wonderful. I will be writing a bit about the coffee pot holding the peonies later in June. Kitchen display with vintage GSW Waffle muffin pan and ACME square tart pan along with an white enameled KITTY dish and a copper colored saddle horse, all in the well worn crate. The crate has seen better years a very long time ago. The ends are banded with hay wire, the bottom is mostly rotted out as have the lower edges. I've been using it as a side table to hold stock boxes as I get things ready to take to my booths. 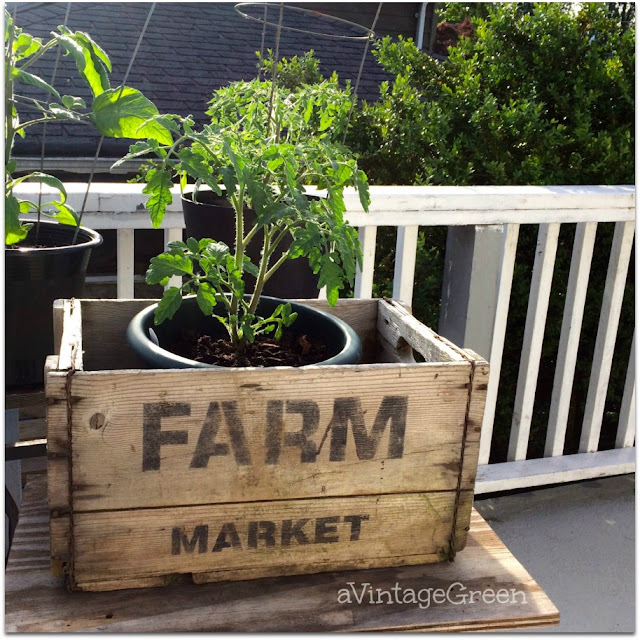 I added FARM and MARKET on one side of the crate and sanded the black back and clear waxed/polished, added a potted tomato plant for a little while. I am moving my 6 potted tomato plants from daytime sunshine to under cover at night - my first try with potted tomato plants. DH plans to replace the rotted pieces with similarly aged wood, glad wood replacement isn't my project. 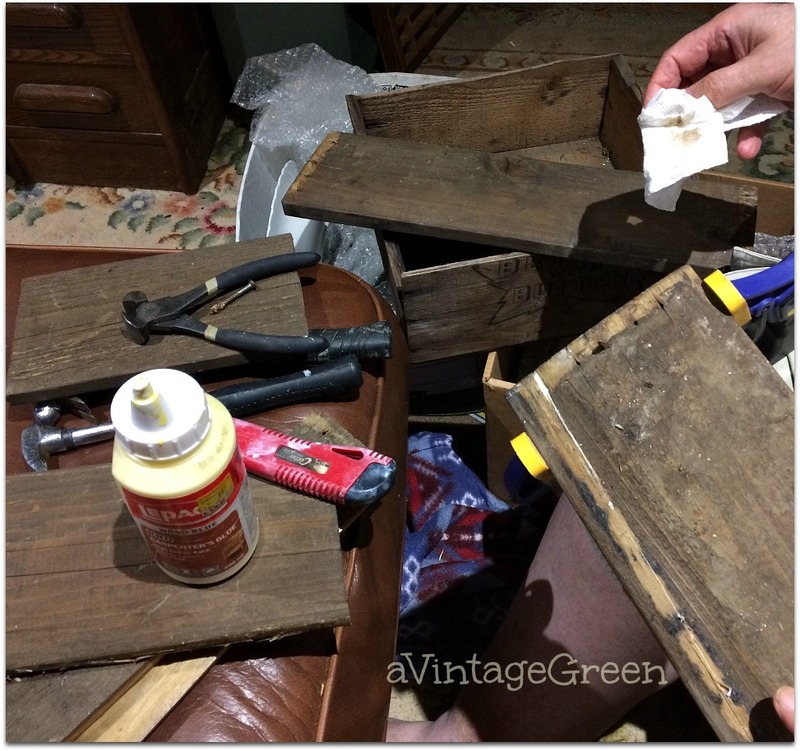 He is taking apart worn wooden boxes, gluing up the boards that are split. Some of the wood will be used for signs and some for repairing or replacing rotted wood like in the crate. update: see the finished repair here. Stencil added to a worn board which was once a step up to a tree house. Small arrow was from the Laundry stencil. Yes it is in my booth. It has been a very busy week, more things that needed to be done than the hours to do them. I know you have been there, done that too. That box has a new life! We do a lot of repair work too, and it definitely pays off even though it's a pain to do. Love that old box in all the ways you used it. 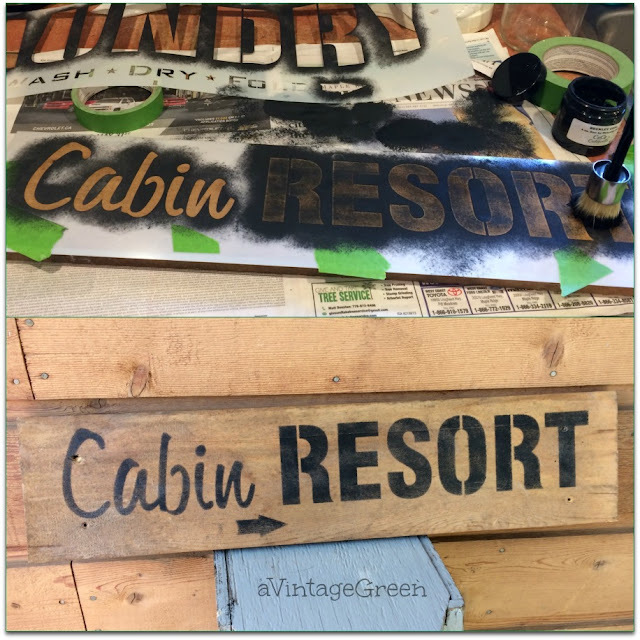 Stencils look the best on weathered wood! Great save on the crate! Love them! 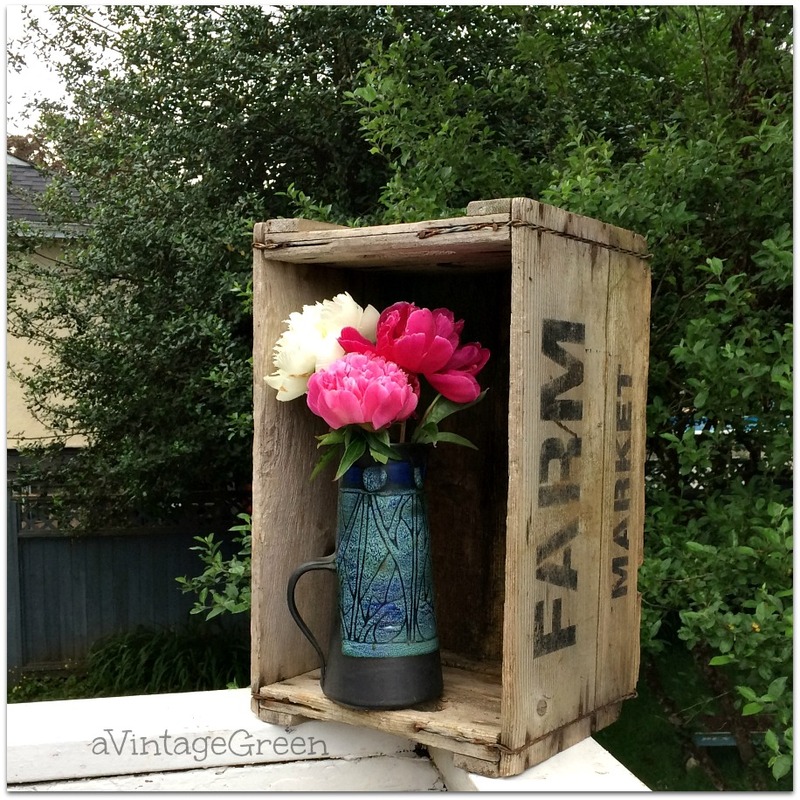 I love the way you stenciled the crate. Loving the sign you made and that peony is just stunning Pat! Great re-purposing! I love the horse...of course! I have an old crate that I found by the garbage bin a few years ago. It's been holding dvds and books, but you've inspired me, so I think that will be changing! Oh Joy your stenciling is always so spot on! I love that old crate, that's how I use things too, I move them from one area to the next while deciding WHERE to use the piece. Thanks for linking up to the Friday Frenzy! I am envious of your stenciling skill, my stencil talent is a big fat 0 lol!! thank you for sharing with sharing with us at Create and Celebrate! What a great team you and your husband are, he repairs, you decorate- end result another beautiful item for your booth. Stencils can't be beat! Love the found crate. So nice to be a couple who "recycles" together. Ha! Happy Monday! Have fun this week. Joy, Very nice crate. The vignettes are wonderful. Love old things too. Thanks for sharing. Have a great week. Sylvia D.
Great projects Joy! Happy Mosaic Monday to you. Pretty and rustic projects. I have a few old boards that I'm hoping to do something with this summer, once school is out for the year. You've done a great work and the result is truly so lovely ! Cute looks! Thanks for sharing at Home Sweet Home! A true gift indeed - love the stencil work! Th stenciling adds a lot of interest to the old wood. The project creates a nice, rustic decorating accessory. Joy only you can take a tired old wooden crate and give it love, make it charming and full of character. It is so lovely like it belongs in everyone's home. I'm glad you saved the worn out crates. They have great character, and look great with the added stenciling! 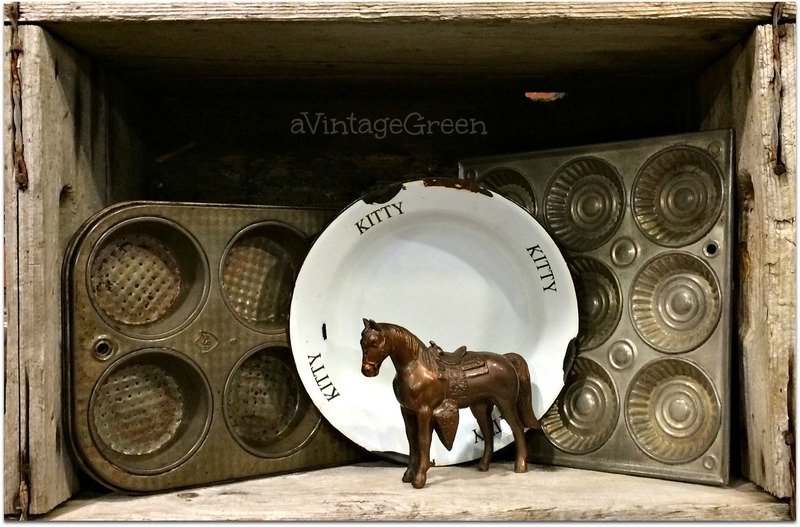 Great that you rescued this treasure, the stenciling is perfect. So much character, it makes me wonder what stories the crate could tell. Hi! I'm one of the co-hosts from the Welcome Home Wednesday Linky Party. I love this re-purposed wood crates. I definitely need to make these for my new house. They'd be so cute on the porch with my flowers and plants! Just gorgeous!! Love the stencil that you used Joy! So much character!